I would like to receive occasional information and updates from Kingston Chamber of Commerce - President's Ball 2018 and jumblebee. 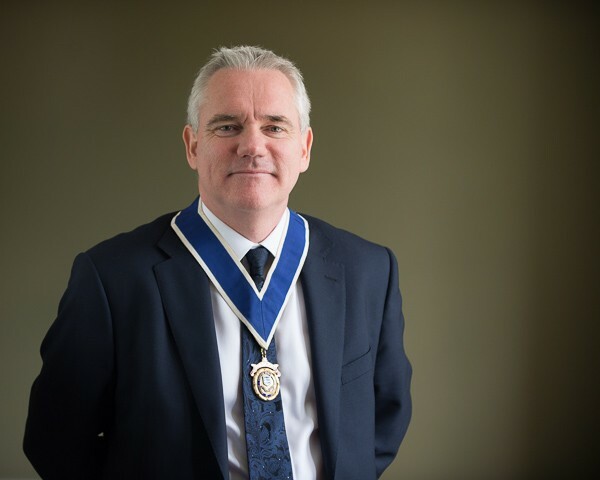 Chamber President, Guy Fallows will be hosting the President’s Ball on Friday 23rd March 2018 at the Holiday Inn Kingston South. 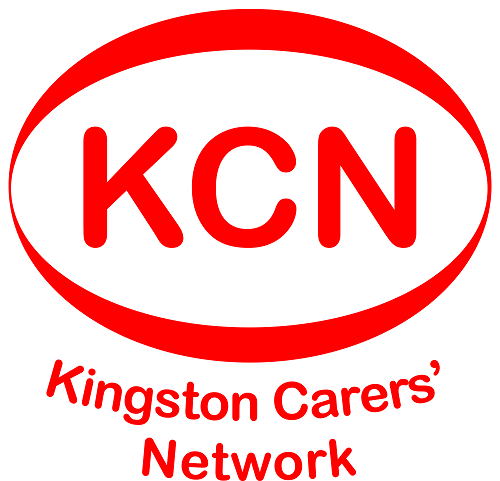 Guy's chosen charity to support at this event is Kingston Carers’ Network (KCN) a local registered charity, providing independent information, advice, advocacy and support to people who care for someone living in the Royal Borough of Kingston upon Thames. Supporting unpaid carers of all ages, including young carers aged 5 to 18. 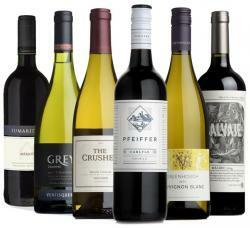 This auction is open for you to bid online until 10 p.m. on Thursday 22nd March when online bidding will close. Bidding will re-open at the Ball on Friday 23rd March, and will only be available at the venue. If you are unable to attend the Ball, but wish to bid on an item, you can still give yourself the best chance of winning by placing a proxy (maximum) bid on this page. We then will carry your bid over to the main auction on the evening of the ball and continue bidding up for you up to your maximum. You will be contacted after the Ball if your bid has been successful. A fantastic opportunity to watch EFL Championship team Fulham FC as they continue their push for promotion to the Premier League. 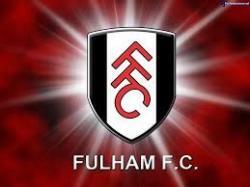 This lot comprises 2 tickets for a match at Craven Cottage the home of Fulham FC. This item is for the live auction, on the the night, only. A unique day for two spent in the company of top punter, racehorse owner and breeder Tim Dykes. - Early morning visits to racing stables in Lambourn with breakfast. - Afternoon (or evening) at the races as an owner's guest, with access to all areas, including meeting the jockey and trainer in the parade ring and (hopefully) post race celebrations. 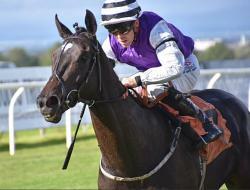 - £100 of free bets placed by Tim with all winnings to be kept by the winning bidder. - If time and racing location allow, a visit to Chasemore Farm Stud in Cobham, Surrey to experience the breeding side of the sport with the broodmares and foals. Arrive early at the top Cheltenham festival winning trainer, Jamie Snowden's yard. See the horses being prepared for their work. Hearty racing breakfast, before travelling up to the beautiful Lambourn gallops to watch the horses exercise. Then down the road to newer trainer Ali Stronge's yard for coffee and a closer up view of how a racing stable functions. Due to the long day and unpredictable nature of racehorses this prize is unsuitable for children attending. Racing plans are only made a few days before the races, and even then are subject to last minute changes due to health of the horse and ground conditions. Tim will endeavour to do everything on one day, but it is possible that we would need to split the prize into two days, with the racing element subject to change at short notice. Experience pre-war motoring in its rawest form: no seat belts, no heater, no roof, just a tiny aero-screen to protect you from the elements! 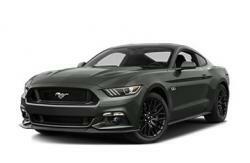 Classic car enthusiast, Chris Hirsch, will pick you up from your home (within 5 miles of Kingston) and drive you to Brooklands Museum in Weybridge – the Home of British Motorsport and Aviation. You will then spend a leisurely few hours, as Chris's guest, exploring the exhibits and soaking up the atmosphere. He’ll even buy you a cup of tea before returning you home. To be arranged at a time to suit you – you may wish to wait for warmer weather. NB: This lot is not suitable for anyone under 18 due to seat belt regulations. Enjoy a relaxing and entertaining evening in Kingston courtesy of The Rose Theatre and DoubleTree by Hilton. 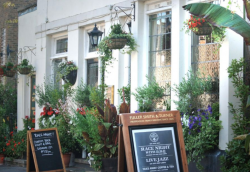 You'll start by checking into the DoubleTree hotel and enjoying a pre-threatre dinner in Hawker's restaurant before taking the short stroll through the centre of historic Kingston to the iconic Rose theatre to take your seats for The Bard's 'Much Ado About Nothing starring Mel Giedroyc. You'll then return to spend the night at the DoubleTree before a leisurely breakfast and departure the following morning. Please note that bookings for each venue are separate. Subject to availability, terms and conditions apply. This item is for the live auction, on the night, only. 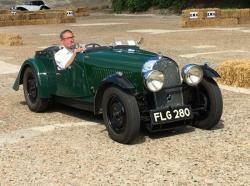 Complimentary hire of 'Jeff', one of the 'Dunkirk Little Ships', carrying up to 25 guests. Ideal for an afternoon cruise along the river Thames either with a picnic lunch on-board and to enjoy the passing scenery or with stops at some of the picturesque riverside pubs. Jeff is a popular choice for family parties, daytime hen and stag events or for corporate use as a team day out or for entertaining clients. 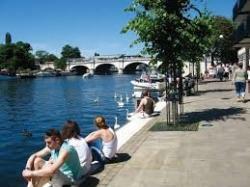 Your river cruise will start at Kingston upon Thames before heading upstream past Hampton Court Palace, Molesey, Hampton , Sunbury and Walton before returning at a leisurely pace to Kingston upon Thames. NB: Daytime only and Subject to availability. A 2-hour golf simulator experience for 6 people. Practice your swing or putting, compete against your colleagues or mates, on any Championship course in the world without having to set foot on a golf course! Want your business to be more profitable, have better cash flow and only require you to work a 4-day week? Want to spend more time with your family, pursuing your hobbies and volunteering? Well you can by using a One Page Plan. Based on the balanced scorecard used by many of the world's most successful businesses the One Page Plan is a performance, measurement and improvement tool that, with consistent use, is the route to your future success, financial security and quality of life. Simply put the One Page Plan is your business plan, summarised in 10 Key Success Drivers, documented on a single sheet of A4 paper. Please note: This item is 8 hours, in total, of business consultancy with Guy Fallows FCA which ideally is spread across 4, 2 hour sessions, facilitated at monthly intervals. 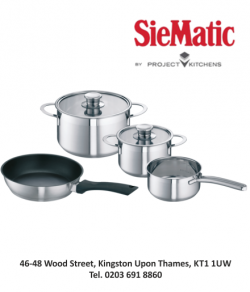 A set of 4 lightweight, state of the art, Siemens saucepans together with a Siematic kitchen apron! For the fun or serious runner this lot comprises entry, for 2 participants, into the Royal Borough of Kingston Spring Half Marathon on 1 April 2018. Team up with a running buddy, perhaps raising money for your favourite cause, and enjoy the exhilaration of crowds cheering you along, in glorious sunshine*, around some of the historic landmarks of the Royal Borough of Kingston. 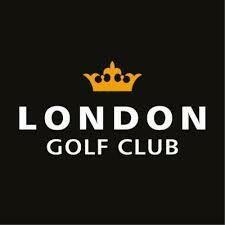 A fabulous opportunity, for you and a friend, to play a round of golf at a championship golf course. Designed by Jack Nicklaus this amazing golf course in the Kent countryside hosted the Volvo World Match Play Championship in 2014. Kingston is steeped in aviation history, right from it's birth in the early-20th century. This is a fantastic opportunity for you to invest in a rare piece of that history. 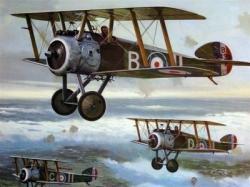 This limited edition print, entitled 'Camel Flight', is of a painting by Sir Kenneth McDonough the celebrated aviation artist and is signed by the legendary designer and manufacturer of the Sopwith Camel, Sir Tommy Sopwith. This is a fabulous way to get simple yet stunning images of your family relaxing and having fun together outdoors. It’s a no frills photo shoot with local photographer, Annie Armitage, with the same creativity, attention to detail, and beautiful, high-quality results as her lifestyle service. 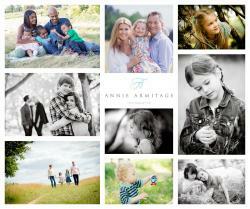 Annie Armitage is one of the top portrait and family lifestyle photographers in the UK. She is passionate about creating beautiful images and loves being with people. She understands how quickly time passes and how important it is to capture cherished family moments. Annie has an incredible skill be being able to put clients at ease so they get the best out of their photoshoot. She can also encourage children to relax and be themselves so that she can achieve stunningly natural images that capture the very essence of their young characters. *Please note that the prize cannot be exchanged for monetary value or the product value used towards another product. 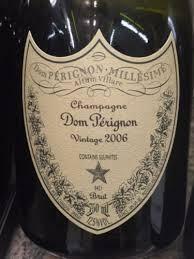 A bottle of Dom Perignon champagne from the 2006 vintage - James Bond's favourite bubbly! 4 park entry tickets to this world-famous attraction. When I was a boy, and this was called Chessington Zoo, it was my favourite day out bar none. I could sit on that little train, that trundled around the perimeter, all day long! That train is still there today. 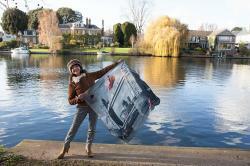 Premium quality silk ballerina scarf designed by an award winning dance photographer Elaine Mayson. Elaine's exclusive scarves are found nowhere else in the world and beautifully boxed with card. Why not spoil yourself or someone very special to you? 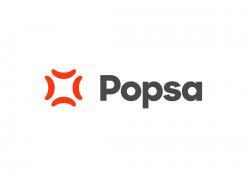 Popsa's deluxe A4 hardback photobooks make an ideal souvenir for a special occasion. Finished in a high-gloss printed cover, you can select any colour you want. The cover also includes your title on the edge of the book. Each of our hardbacks is completed with end-papers at the front and the back to protect the photos inside from collecting dust. 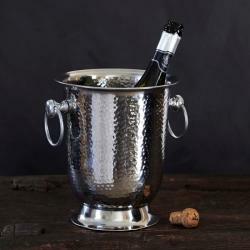 This sophisticated and elegant cooler is the ideal way to keep your bubbles chilled, whatever the occasion. Designed in a heavy stainless steel with a delicately hammered finish, it features two ring handles on either side for easy lifting. It is the perfect accompaniment for an elegant champagne coupes whether you’re entertaining or simply enjoying an evening à deux. A(nother) fantastic opportunity to watch EFL Championship team Fulham FC as they continue their push for promotion to the Premier League. 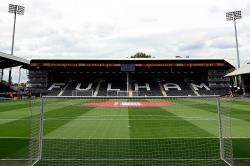 This lot comprises 2 tickets for a match at Craven Cottage the home of Fulham FC. For the fun or serious runner this lot comprises entry, for 2 participants, into The Harry Hawkes 10 Miles on 24 June 2018. Team up with a running buddy, perhaps raising money for your favourite cause, and enjoy the exhilaration of crowds cheering you along, in glorious sunshine*, around some of the historic landmarks of the Royal Borough of Kingston. 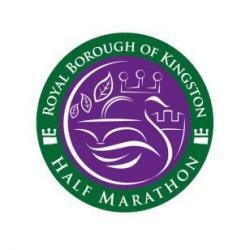 For the fun or serious runner this lot comprises entry, for 2 participants, into the The Royal Borough of Kingston Autumn Half Marathon on 7 October 2018. Team up with a running buddy, perhaps raising money for your favourite cause, and enjoy the exhilaration of crowds cheering you along, in glorious sunshine*, around some of the historic landmarks of the Royal Borough of Kingston. 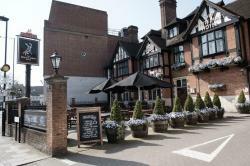 Enjoy an overnight stay, followed by a leisurely breakfast, for 2 people at this historic Fullers-owned hotel. 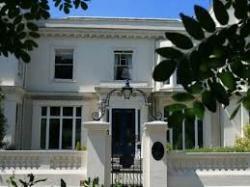 Perfectly situated within walking distance of both Kingston town centre and Bushy Park. Surbiton Golf Club has a heritage stretching back to 1895. Situated in the leafy suburbs of London, close to Kingston and the A3, the course – one of the best presented in Surrey – continues to evolve and adapt to golf technology, and the needs of golfers of all levels. As a result, the 6,056-yard (par 70) course offers a surprising test - with narrow fairways, subtle greens, plenty of mature trees and changes in elevation. Members love it because every round feels like a different golfing experience. Visitors and societies are welcome during the week and we prides ourselves on ensuring that all visitors have a very enjoyable experience. Something to celebrate? Then it's time to crack open the chilled bubbly! This item, for 4 people, is not to be missed. I went there with my family in January. It was superb. End of. A pair of top tickets, subject to availability, to the Rose Theatre's production of Don Carlos starring Tom Burke. We are delighted to announce a major new revival of Friedrich Schiller’s Don Carlos starring Tom Burke. 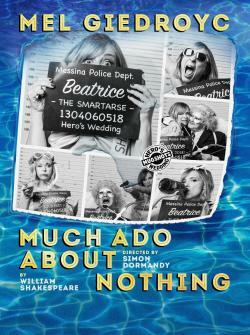 This great romantic drama forms part of the Rose’s 10th anniversary season alongside Much Ado About Nothing starring Mel Giedroyc. Rawn Jackson, Qualified Approved Driving Instructor, is offering 6 hours of driving lessons, either for a beginner or anyone who would like a refresher course. Rawn is based in Kingston and knows the local roads and test routes very well. He is calm, professional and very good with new and nervous drivers alike! Normally taken in 3 blocks of two hours. The value of these lessons is £180. 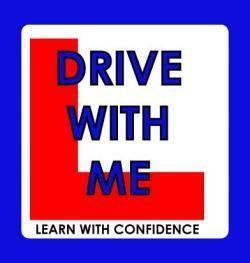 Lessons to be taken in the Kingston and surrounding areas. Enjoy a powerful and relaxing Sound Healing session, get some guidance on something that is holding you back, or hear comforting messages from loved ones in Spirit. 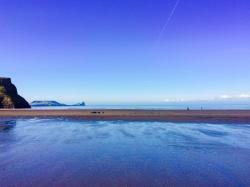 Helen is an experienced healer and medium based in Surbiton. She is offering a free 1-2-1 session to help you feel better. Value is £70 for a maximum 90 minutes. Check here and see what Helen can best help you with. 4 tickets for the Bet365 Jump Finale on Saturday 28th April 2018. We are expected to welcome a crowd of over 14,000 people to this day of celebration and glory as we crown the champions of the 2017/2018 Jump season. Broadcast live on ITV Racing, this is a marquee event for Sandown Park which sees the leaders of the sport receiving their trophies for their triumphs. Every race counts leading up to this day and this is what everyone will be talking about as the Jump Season draws to a close. Developed by Dr Zein Obagi, a world-renowned skincare expert, award-winning inventor, educator and author, this item comprises 4, high quality, high value, skincare products from ZO Medical. A lightweight lotion designed to help protect and repair all skin types. A complete anti-aging formula that works overnight to repair and regenerate. Apply 1-2 pumps over face and neck 30 minutes before bedtime. Apply starting at your pulse points, smoothing into hands, wrists and cuticles. Reapply after washing hands or as needed. Can be used AM or PM. 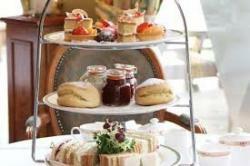 Come and savour our sumptuous and quintessentially English tradition; Afternoon Tea. Delicately prepared selections of finger sandwiches are accompanied by exquisite pastries, bite size cakes and sweet treats, and of course finished with a side of warm, freshly-made scones and a generous serving of our homemade preserves and clotted cream. Choose from a wide selection of loose leaf traditional and fruit teas perfectly brewed to exacting standards. 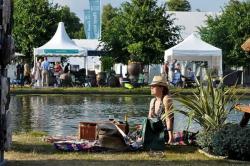 We'd love you, and a guest, to celebrate with us on the eve of the world-famous Hampton Court Palace Flower Show and be the first to enjoy the stunning show gardens, live music, and fabulous fireworks.